Everett City Hall is located at 484 Broadway, Everett, MA 02149; phone: 617-389-2100. 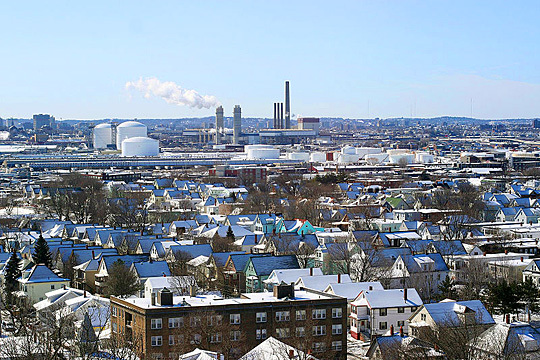 Photo: Everett in the Winter, City of Everett, MA, photographed by InvictaHOG, 2007, en.wikipedia.org, accessed February, 2011. A year before John Winthrop's fleet dropped anchor in Salem Harbor, three brothers were exploring the virgin timberland along the Mystic River. Diverging a trifle from their course, they came upon a country which one of the brothers, Ralph Sprague, reported as an 'uncouth wilderness' (uncouth then meaning 'wonderful,' 'uncommon') full of 'stately timber.' This is the first record (1629) of a white man's visiting the three square miles of territory that now contain the City of Everett. In the first half of the nineteenth century, South Maiden was important principally because of the commanding position which it occupied in the overland communication to Boston. A penny ferry, opened in 1640, had formerly been the most direct route to the capital. From the back country one of the oldest New England roads led to the ferry. In 1796 a country road was laid out, three rods wide, running to Maiden Bridge, built ten years before to supplant the ferry. Private capital financed the construction of Maiden Bridge, which the Maiden Bridge Corporation owned and operated as a toll bridge for seventy-two years. During that time the round trip from Maiden to Boston was costly: the tolls amounted to forty-seven cents, a heavy tax in a time when a daily wage rarely exceeded a dollar. When the Newbury Turnpike Corporation decided upon South Maiden as a terminus for the new highroad to Newburyport, the first step was taken in making the future Everett a consequential post in the transportation plan of the Commonwealth. Yet, in spite of its favorable location in the system of communication between Boston and the north country, Everett's progress before 1870 was slow. Until 1845 the town was engrossed in agriculture. In 1859 toll charges were done away with on the Maiden Bridge, thus attracting more business and more residents to the town, which in 1870 was incorporated under the name of Everett, in honor of the illustrious orator, statesman, and scholar Edward Everett.